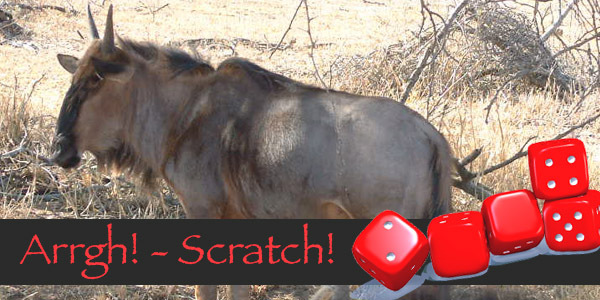 The Wildebeest is the Yahtzee Dump Score Roll of the Animal Kingdom. I love to read news stories about the strange creatures found by scientists each year. They make me feel that the creatures I create in my writing are possible, if not likely. Seeing the weird and wonderful things that exist make me wonder what else could be out there, and what better to fire me up to write than something that makes me wonder? Create a creature. Imagine that you’re a scientist, you’ve travelled to some far off land, or deep into the sea to discover new and likely-endangered creatures. What does it look like? What makes it strange? Why does it have that strange characteristic? Will you be rich for discovering it? Spend ten minutes exploring the improbable. NB. If you’re having difficulty with a place to start, choose a sub-set of animals that has a specific set of characteristics that you must include, then explore from there. For example molluscs are quite varied, but all of them have a mantle, shell and foot. ← When You Forget the Bracket on a Smiley, it’s Just Eyeballs…creepy eyeballs staring at you sideways.